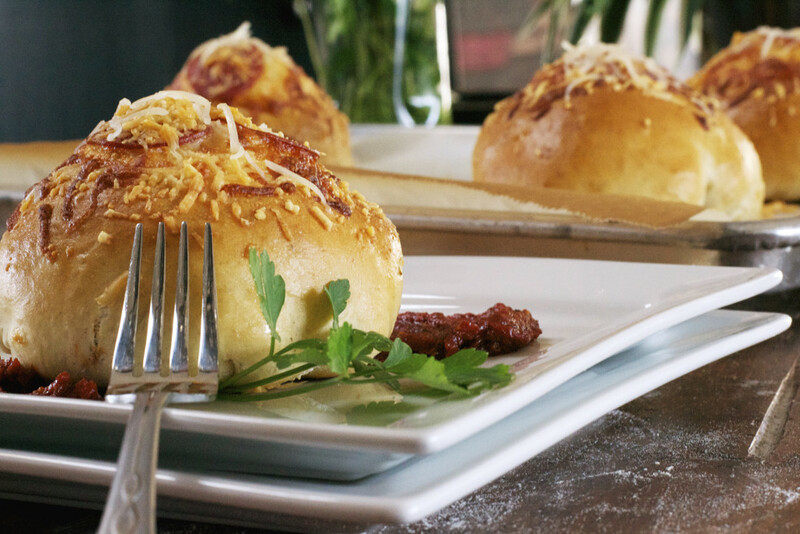 Pizza Burger - What the Forks for Dinner? What happens when you combine two fantastic tastes……….scrumptious magic……yummy OMG…….I have to have a bite now magic !!!!! Pizza Burger! 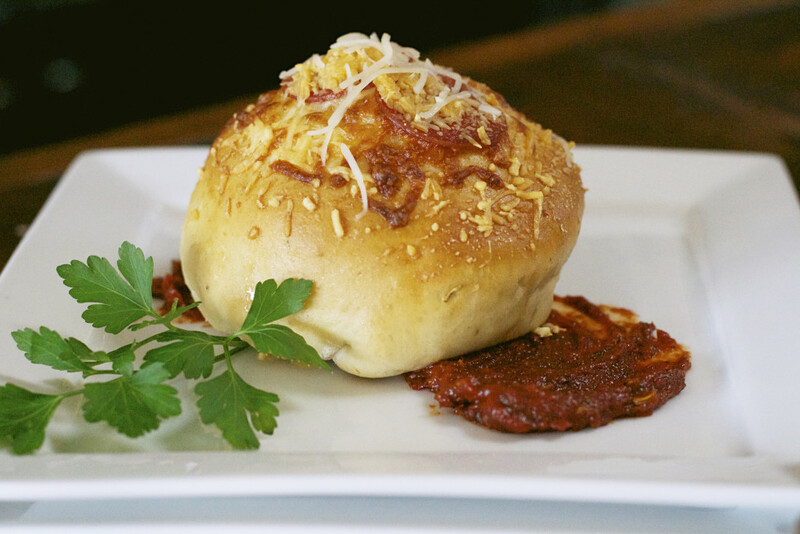 Ok ,ok I know how it sounds…….Pizza Burger……..you can hear the silence………..oh but wait, it is truly something. We all see shared posts about food on Facebook, but sometimes something will catch your eye. One of my co-workers and Facebook friends posted a pizza burger. My mouth was watering and my mind was reeling. So thank you Mike for putting me on the Pizza Burger path. I will admit the burger, is just a plainish burger. I mixed hamburger, pork sausage and Italian seasoning, formed patties. Tim formed the patties, he is a perfect patty former! Then, we just cooked them up. But that plainish burger gets dressed up real purdy………..
Pizza sauce…..thick, slightly spicy, garlic and red wine infused, along with pepperoni and a blend of Italian cheeses, set on a circle of Italian seasoned pizza dough…….crunchy on the outside, chewy on the inside……pizza dough for a pizza burger ………after all, a burger needs a “bun”. I made both the dough and the sauce ( recipes for both )…….rolled the dough into circles,well as close as I could get to a circle. Pepperoni first,cheese next, big dollop of sauce, burger………wrap the dough around the burger. If you need to, trim away some of the dough so it fits around the burger nicely. Flip them over onto a parchment lined baking sheet, brush with egg wash, more cheese and pepperoni……you can never have to much cheese when the word pizza is involved. 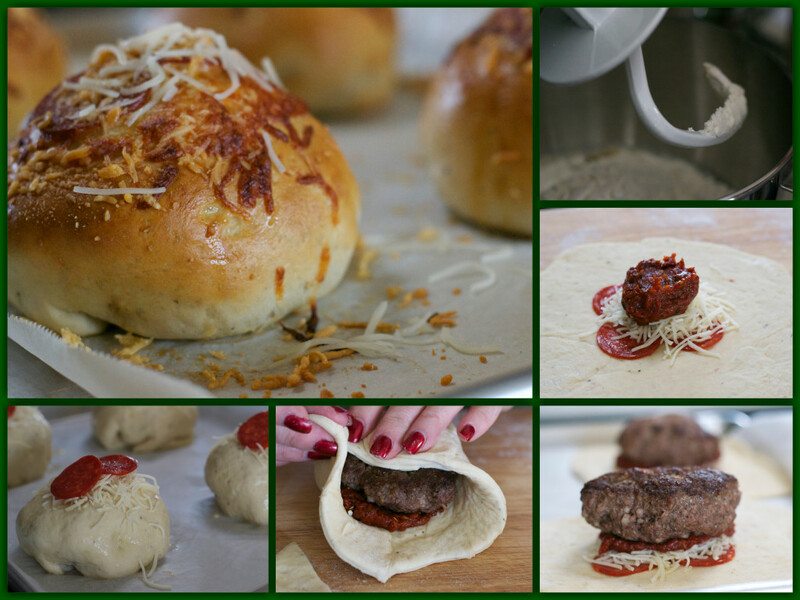 Into the oven to bake, and Mama Mia……….Pizza Burgers!! Combine yeast and water in a stand mixer or large bowl. Let stand for 5 minutes. Add remaining ingredients and mix until incorporated. If using a stand mixer with a dough hook ,knead dough for 7-10 minutes until smooth and elastic. If you are not using a mixer knead dough on floured surface for the same length of time. Place dough in a greased bowl and cover. Let rise in a warm place for 1-2 hours or until doubled in size. Punch dough down and roll into desired shape. Heat olive oil over low heat. Add garlic and other seasonings and heat in olive oil for a couple of minutes, stirring constantly and adjusting heat if necessary. You just want to warm the ingredients not fry them. Add tomato paste, red wine, and sugar, combine well and bring to a simmer. Simmer for 5 minutes. Remove from heat and set aside. Mix all ingredients well and form into 6 patties. 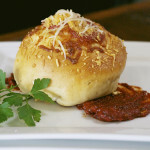 Roll pizza dough to form six circles( you will not use all the dough from the recipe so you you can freeze the remainder for another use) Make circles large enough to cover the burgers. On the circles place 4 pieces of pepperoni , 1/4 cup cheese, heaping tablespoon pizza sauce and place burger on top. Fold dough around the burger to cover the burger completely with dough. Turn dough cover burgers over and place seam side down on a parchment lined baking sheet. Brush each burger with an egg wash ( 1 egg and 1 tablespoon water whisked together). Top with 2 additional slices pepperoni and remaining cheese. Bake in 475* oven for 15-20 minutes or until golden brown. Serve with remaining pizza sauce if desired.